Bipin K (name disguised), a banker on the fast track, was just 32. He had jumped three jobs in five years. For a week, he had been feeling the fatigue that came from putting in 14 hours at work. His vision occasionally blurred. His wife, Ananya (name changed) took him to the doctor, who advised him to exercise. One night, working alone in his 18th floor cubicle, he felt a severe pain in his chest. His breathing was ragged, and his heartbeat felt irregular. The pounding in his chest, neck and ears started to become a drumroll. He managed to call 102 for ambulance service. A day later, he was dead of a hemorrhagic stroke, which had brought about a spike in his systolic blood pressure (SBP). A new study estimates that India ranks second on the list of lazy countries. Four billion adults in the world had SBP between 110-140 mm Hg or higher. “Inactivity is leading to high blood lipid levels, blood pressure, blood glucose, cardiac arteries, obesity, clotting and more. The logic is simple. When you’re inactive, you put on extra weight. It puts pressure on your heart and circulatory system. You become susceptible to heart and other kinds of disease,” says Dr Vanita Arora, Associate Director and Head, Cardiac Electrophysiology, at the Max Super Speciality Hospital in Saket and Patparganj in Delhi. The future looks even more frightening. A recent study by sports education company EduSports, which covered 1,69,932 children aged 7-17 years from 326 schools across 86 cities in 26 states, found that one in three children does not have a healthy Body Mass Index (BMI), cannot sprint for their age and lack adequate upper body strength. One in four children lack desired flexibility. Two in five children have low adequate lower body strength. The share of children with unhealthy BMI has increased from 20 per cent in 2015 to 33 per cent in 2016. Over the past decade, medical studies have zeroed in on India as one of the world’s laziest countries. A study by the Indian Council of Medical Research (ICMR) reports that over 90 per cent of Indians, in both cities and rural areas, did no recreational physical activity. According to Dr Arora, incidents of coronary artery diseases have increased by 20-25 per cent in the last five years—a lifestyle blowback. Cases of micro vascular angina have spiked by 20-22 per cent. The age bracket of the patients have come down from fifties two decades ago, to thirties now. The study on diabetes in India estimates the number of physical inactive people at 392 million. On an average, Indians clock just 19 minutes of daily activity while the medically recommended quota is at least 30 minutes. “People quote being busy as their biggest excuse. But you simply need to take out 30 minutes in a day to work out for the most important person in your life—yourself,” says Dr Amrapali Patil, Delhi-based weight management expert. 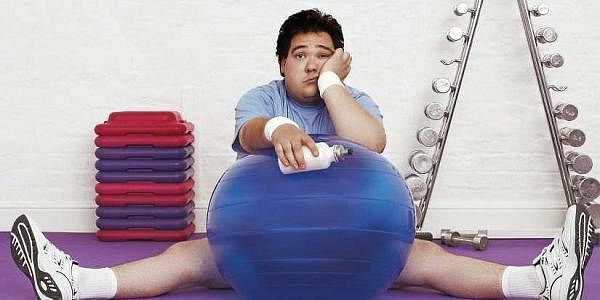 Inactivity leads to obesity and a host of diseases, especially heart-related. Early in January, a retired army jawan filed a petition in the High Court that policemen are reluctant to chase criminals because they are physically unfit. He even submitted photographs of potbellied cops and their officers, including overweight policemen sleeping on duty. The court ordered the government to submit a report. Physical conditions of law-keepers apart, there are very few studies on physical activity in India. A 2014 report reveals that one in two Indians does not exercise. “Obese people walking into my clinic are looking for a magical wand. Sadly, I don’t have that. The list of reasons for not being able to exercise is endless—long working hours, social engagements, difficulty in waking up early, laziness, lack of motivation, social media addiction and low energy,” says Dr Uma Gupta, nutritionist. In one of its reports, the World health Organization (WHO) has identified India as one of the nations with high lifestyle disorders. Every fourth person has stress-related problems. A combined survey by All India Institute of Medical Sciences and Max Hospital shows an alarming rise in hypertension, obesity and heart disease, especially among the young. Stress is often the starting point for most modern day ailments. An ICMR paper (2004-2009) in three cities reveals that 8-10 per cent of the urban population suffers from stress; 15-20 lakh people are affected in Delhi alone. “Chronic stress can result in unhealthy habits, such as smoking, inactivity, alcohol abuse, eating poorly, social isolation. Under stress, our breathing becomes rapid and shallow, which deprives the heart of oxygen,” says nutritionist Kavita Devgan. To long work hours, add tobacco use and alcohol. Both intoxicants impede the absorption of calcium. Heavy drinking and smoking causes blood sugar levels to spurt, affects adrenaline secretion and cardiovascular health. Laziness also impacts the mental functions. Physical and mental activity releases endorphins or ‘feel good hormones’ into the brain, which is affected by urban lifestyle choices. “Therefore, we’re in a chronic state of mental fatigue that leads to sleep deprivation. Changed levels of serotonin, norepinephrine and dopamine cause clinical conditions like anxiety, depression and obsessive behaviour,” says Dr Sandeep Vohra, Senior Consultant, Psychiatry, Indraprastha Apollo Hospitals, Delhi. Over-dependence on technology has compounded the problem. Twelve-year-old Tanvi Savara, studying in a reputed public school in Mumbai, was a compulsive iPad user. The daughter of absentee parents who travelled on work most of the month, she was being brought up by Shashwati Mandal, her grandmother. “Tanvi would spend four-five hours on her iPad after school, checking Facebook, Twitter and Instagram. She began to experience mild amnesia after a while,” says Shashwati. Tanvi was diagnosed with nascent cognitive dysfunction due to digital addiction. She has now been forbidden from using any kind of screen-based technology for at least a year. Her doctor also prescribed two months of de-addiction therapy. Laziness influences not just the mind, but the bodies of children, too. A significant generational change in urban children is the lack of play. The courts have upheld the right of children to play. “Playing improves mind-body coordination and concentration. This is akin to meditation of sorts,” says Dr Patil. Though Delhi-based homemaker Madhu Hans encourages her eight-year-old daughter Meheka to spend at least two hours playing outdoors, she bemoans the lack of parks. “Our cities don’t accommodate the interests of children. Roads are broken, green areas are ill-maintained and safety is a big issue,” she complains. With pollution levels rising, parents are unwilling to send their children outside to play. Studies show that exercise benefits schoolchildren exponentially. A study on schoolchildren in the US shows that after 30 minutes on the treadmill, the problem-solving ability of students went up by 10 per cent. However, the treadmill has no role to play in the life of Avantika Johri, who studies in a well-known private school in Jaipur. She wakes up in the morning with terrible spasms gripping her back. At times the pain is unbearable. On good days she gets just an hour of peace. Avantika is just 10 years old and 45 kgs; overweight by 13 kgs for girls her age. With no history of obesity in the family, her mother Shilpa blames the school for converting almost all sports periods into academic classes. Once the child gets home after classes, homework pressure builds up. “Where is the time to go out and play?” she angrily questions. Tired, Avantika finds technology a comfortable and easily accessible alternative to playing. The EduSports study notes the fitness levels of schoolchildren in India are dropping both in metro and non-metro cities. Only 66 per cent children in metros had a healthy BMI versus 65 per cent in non-metros. One-third of all children in all five regions have unhealthy BMI scores: 37 per cent (Central), 36 per cent (East), 39 per cent (North), 37 per cent (South) and 34 per cent (West). The weighted scores for these regions across all fitness parameters do not vary much. The fitness levels of children in metro and non-metro cities were similar. “Schools have a clear advantage over homes, clubs and academies. They have the necessary resources, such as safety-compliant infrastructure, trained teachers, a dedicated time for sports and a healthy environment to build team spirit and competition. Schools provide the best avenue for replicable intervention to get children more play time,” says Saumil Majmudar, CEO and Co-founder, EduSports. What makes matters worse is that the Indian body type is genetically mesomorphic, characterised by high fat and low muscle mass. We’re prone to sluggish livers and multiple metabolic defects. “Indian hearts age faster. We have narrower arteries and are genetically three times more vulnerable to heart attacks compared to Caucasians. We also smoke and drink excessively. Hence the lifespan of Indians with heart disease is significantly lower than their western counterparts,” shares Devgan. A solution to staying fit is to understand the fitness cycle. “Research shows people who exercise regularly in the morning, but stay inactive throughout the day, have similar health concerns as the sedentary population,” says Gagan Arora, a Reebok master trainer. He reiterates the importance of taking a quick flight of stairs instead of opting for the elevator, walking small distances, parking cars away from the shopping places and using public transport. Laziness is the new elephant in the room. India needs to stop it from stomping all over the place.